This week's TGIM is about perspective. In order to be successful, you have to change your mentality and see your own opportunities. We have everything we need to be successful, but most of us don't fully utilize our tools. Most likely because we are not looking at them the right way. This ties in with what I heard Tony Robbins say : "The problem is not a lack of resources, it's a lack of resourcefulness". Every so often I think about what my opportunities are and wonder what I can do with what I currently have to improve myself, the things that I do and how I can benefit others as well. Somewhere, there's someone that would be able to do a lot more with the exact same resources. So what should I do to get there? It's not an easy thing to do, but at the same time it is. ET says the issue is effort, or lack there of. We have the resources, but if we don't use them nothing will happen. So we have to get pass this barrier we put on ourselves, the piles of excuses of why we didn't do this or that and just do it. Perhaps thinking about the opportunities whatever effort would bring can help get over that barrier. 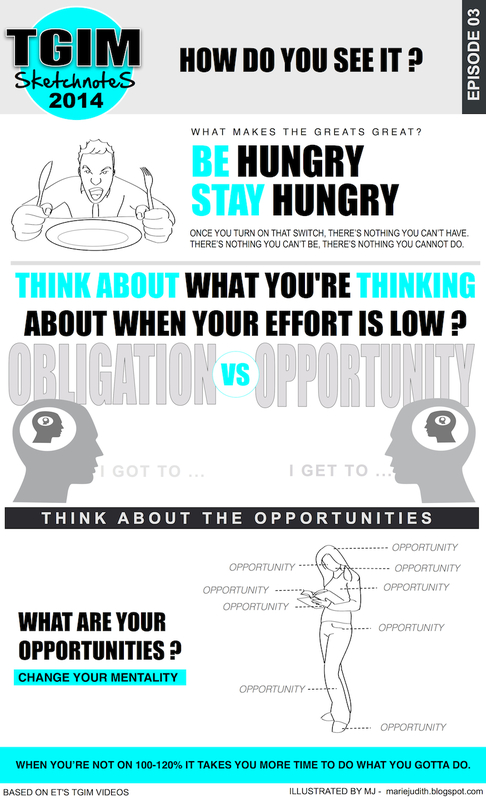 What are your opportunities?